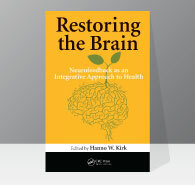 The new book Restoring the Brain: Neurofeedback as an Integrative Approach to Health is now in print. We received our initial copies from the publisher, Taylor and Francis, just in time for the July Summit. Here is the story of how this book came about. In September 2013 Hanno Kirk and Kelley Foust jointly presented “EEG Neurofeedback in the Treatment of Mental Health Disorders” at the Integrative Medicine and Mental Health conference in Chicago. It was a new topic for most of the conferees and there were many questions from the audience. One person who was impressed by the presentation was the Acquisitions Editor of the Health Division of Taylor and Francis Publishers. He contacted Hanno Kirk and asked if he would like to expand the material in the PowerPoint into a book. “Given his enthusiasm and interest I felt I couldn’t turn down such an opportunity,” Hanno related. “After consulting with Siegfried, I assembled a team of twelve writers and told Lance Wobus that I would take on the role of editor.” The book contract was signed in February 2014, and on September 2, all chapter manuscripts were delivered to the publisher. In the first section Hanno Kirk traces the evolution of the concepts of brain functioning; Siegfried Othmer takes us from the beginnings of neurofeedback through the development of the Infra-Low Frequency (ILF) training approach. David Kaiser provides us with the scientific basis for ILF training with his description of the critical functions of astrocytes and glial cells in the temporal regulation of the brain. Meike Wiedemann rounds out the section with a masterful description of Infra-Low Frequency neurofeedback in clinical practice as it has developed at the hands of Sue Othmer. The second section looks at neurofeedback in the context of Integrative Medicine. Doreen McMahon, describing how she has incorporated neurofeedback into her medical practice, prepares the ground for other physicians to do so in their practice. In her chapter on diet and nutrition, best-selling author (and long-term neurofeedback practitioner) Nora Gedgaudas talks about how the presence or absence of specific nutrients in our body powerfully impacts brain functioning. Kurt Woeller, a well-known integrative medicine specialist, discusses how biomedical factors, such as infections in the lower intestines, can interfere with brain functioning and thus can be critical factors in the success of neurofeedback. The third section of the book gives examples of how ILF neurofeedback is applied to different brain dysfunctions. The first in this section is by Kelley Foust, an Occupational Therapist, who describes her success in using neurofeedback for the treatment of children in the autism spectrum. The second is by two psychologists, Anna Benson and Tamsen LaDou, who have used Infra-Low Frequency neurofeedback for five years in the treatment of combat stress, and have guided nearly 1,000 active duty Marines and Navy personnel through the training program. Monica Dahl goes into detail on how Infra-Low Frequency neurofeedback works in symptom reduction in PTSD. In Chapter 11, Roxana Sasu and Siegfried Othmer review the data on several representative training histories for ADHD. Additionally, they present the cumulative data set for a continuous performance test. Results are shown for a pool of over 5,000 for whom pre-post data were available, irrespective of diagnosis. All had had the benefit of about twenty sessions of Infra-Low Frequency training using the Othmer protocols. The book closes with a chapter titled “The Future of Neurofeedback,” by Siegfried Othmer, which takes an upbeat look at the promise of neurofeedback, but is also mindful of the impediments the lie along the road ahead. The book seeks the attention of medical professionals, including in particular psychiatrists and neurologists, because acceptance by the medical community is critical to the success of neurofeedback in our society. This entry was posted on Thursday, July 23rd, 2015 at 2:23 pm	and is filed under Neurofeedback. You can follow any responses to this entry through the RSS 2.0 feed. You can leave a response, or trackback from your own site. Authors: Hanno Kirk, Siegfried Othmer, David Kaiser, Doreen McMahon, Nora Gedgaudas, Kurt Woeller, Kelley Foust, Anna Benson, Tamsen La Dou, Monica Dahl, Roxana Sasu.